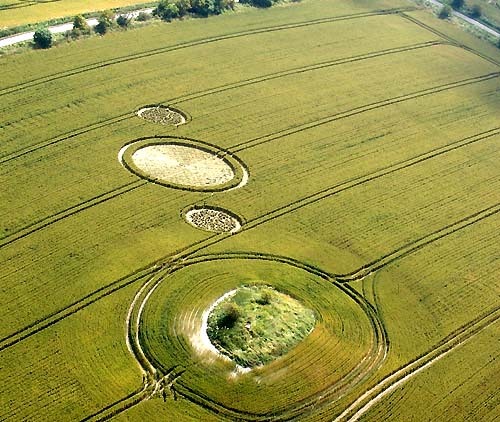 Charlbury, Wiltshire, formation of nearly two hundred “wheat bundles” in two of the three circles lined up with the Charlbury ancient mound was discovered from the air on July 11, 2006. 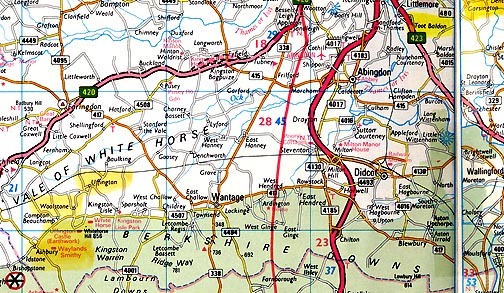 The pattern was located near the Ridgeway between Liddington Castle and Uffington White Horse. Images above and below © 2006 by Cropcircleconnector.com. 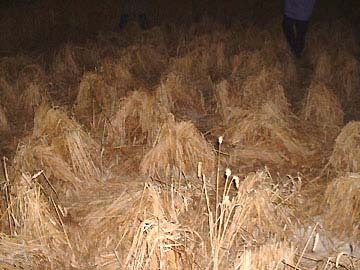 Wheat “bundles” in foreground circle (86 by one count in this circle; about 175 bundles in both circles) and ancient Charlbury mound in background. Image © 2006 by Steve Alexander. September 13, 2006 Albuquerque, New Mexico – After our frustrating trip to Toot Baldon near Garsington, Oxfordshire, on Thursday, August 3, 2006, most of us decided to drive back to Charlbury in Wiltshire southwest of Wayland’s Smithy to see the extraordinary “circles with wheat sculptures inside,” as some called it. 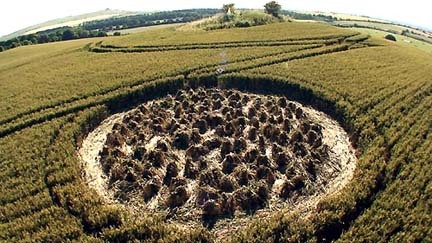 The unusual formation was first reported on July 11. 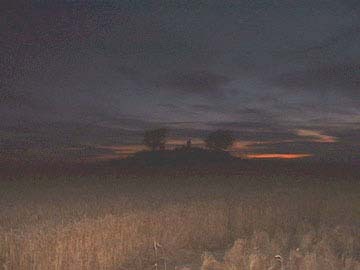 Red western sky beyond the Charlbury mound and the bundles of wheat inside the circle furthest from the mound in the lower right. Image © 2006 by Jennifre Kreitzer. 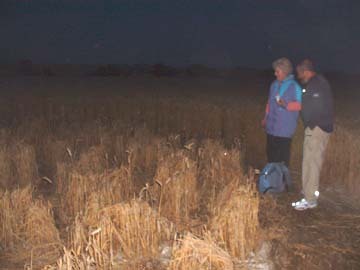 Crop circle investigator and author, Barbara Lamb, with a colleague standing in the ring of wheat bundles furthest from the mound. 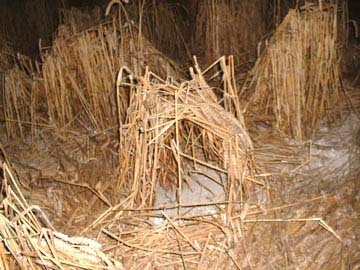 Image © 2006 by Jennifer Kreitzer. 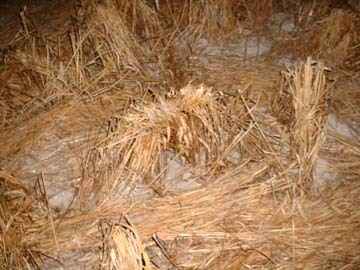 Above and below: Glimpses of the unusual wheat bundles lighted by camera flashes as the sky darkened. All images © 2006 by Jennifer Kreitzer. Jennifer Kreitzer was taking digital pictures as she walked through the Charlbury circles. “Afterward, I was going through the images and noticed there was a ball of light in one of them.” I had been taking 35mm standard reflex lens images, with flash and time exposures. None of my prints showed any mysterious balls of light or translucent spheres. 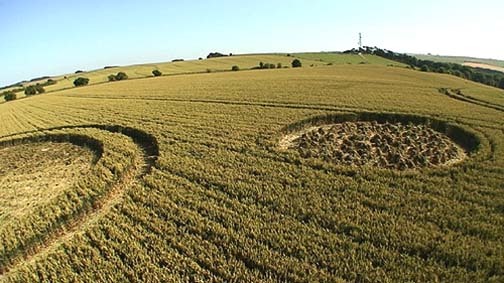 One of the persistent puzzles in crop circle history is why do some people photograph anomalies, while others in the same formation at the same time do not. 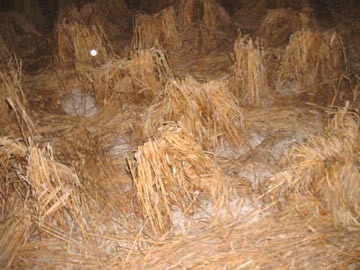 Unexplained, white ball on one digital frame inside the circle of wheat bundles furthest from the mound. Image © 2006 by Jennifer Kreitzer. 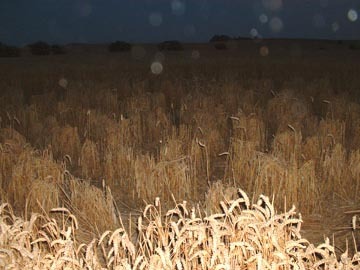 Different than the white ball are these translucent orbs, more commonly photographed by many people in crop formations – especially by digital cameras. One hypothesis is that an electrostatic charge builds up in the digital camera electronics and periodically discharges, producing the translucent orb effect. Image © 2006 by Jennifer Kreitzer.